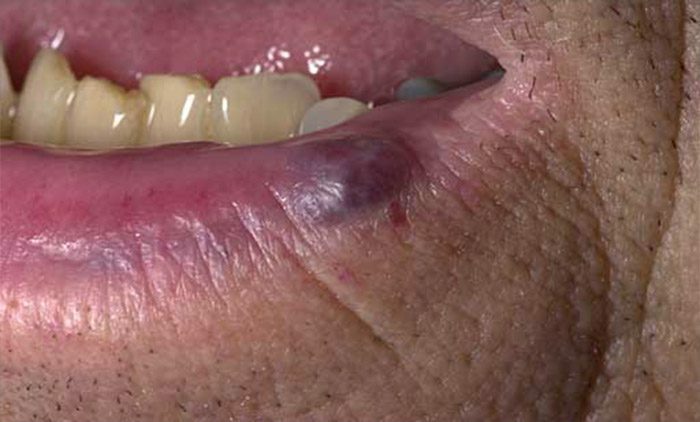 A venous lake is a common vascular deformity that can appear on the vermilion border of the lip, on the ear, or on the face. It is a dilated venule thought to be caused by a combination of chronic sun exposure and age and thus most commonly effects the elderly. It is a benign lesion with no symptoms besides the changes in skin appearance but it can mimic the deadly melanoma or a pigmented basal cell carcinoma. For this reason this lesion may be biopsied to rule out malignancy. Treatment is unnecessary but is commonly sought for cosmetic purposes as venous lakes can be considered unsightly. Surgical removal is effective but tends to leave scars and carries light risk as these lesion tend to bleed profusely when cut. Many other therapies such as cryotherapy, electrodessication, laser ablation (carbon dioxide laser), and sclerotherapy can effectively remove venous lakes but can cause scarring, pigment changes, and many require multiple treatments. Therefore, the most commonly utilized treatment is through pulse-dye lasers. The wavelength of these laser devices specifically targets blood and is very effective at targeting the vascular structures found in venous lakes while leaving the surrounding tissue unharmed. Thus there is a very low risk of complications such as scarring and only one treatment is typically required. Contact your dermatologist if you believe you have a venous lake to have it examined and treated.